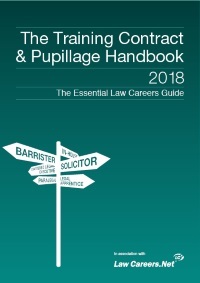 This year’s edition of The Training Contract & Pupillage Handbook (TCPH) is now available. This much-respected resource is the first place you should turn to for help and should be your guide as you search for the legal career that is right for you. Once again, we have interviewed dozens of practitioners to give you a clear picture of their areas of expertise, and sourced advice and views from the best graduate recruiters in the business. "Insider reports" offer you first-hand accounts of what vacation schemes are really like. There is also crucial detail on interview and application techniques, diversity in the profession, alternative career options and work experience. Copies will be handed out at university careers services and law faculties over the next few weeks, and by the LCN team at a variety of law fairs. You can also purchase the handbook online at www.tcph.co.uk from Wednesday 1 November. Make a trip to your law faculty, careers service or law fair to secure your copy. And remember – TCPH is best used in tandem with LCN, so familiarise yourself with the Jobs page and training contract search, and sign up for MyLCN, which allows you to manage your applications online.